Decades ago, one of my friends was volunteering with Mother Teresa in Calcutta, India, and one of these major donors walks into the place, checks everything out, and at the end asks her, “Can I take a photo with you?” Mother Teresa says, “Sure.” Except that the photo wasn't quite perfect. He says, “Can you move over just a little bit here.” Took another photo, and another. At one point, they moved her face to the right and to the back. What Mother Teresa saw in this financially affluent person was a certain kind of poverty of spirit. But she just didn't stop there. She responded to that with different forms of wealth. She responded to that with the wealth of acceptance, of tolerance, of forgiveness, of kindness, of compassion. What she teaches us through that anecdote is that, yes, there are multiple forms of poverty and there are also multiple forms of wealth. In our society today we're too biased towards the direction of financial wealth. Wealth is equated to money, even when there are so many different forms of wealth. That singular money orientation hasn't quite worked out too well for us. Just last month, Oxfam released a report that showed that 62 people in the world own more financial wealth than the bottom 3.5 billion -- more than half of the world's population! That dramatically affects our well-being. Not only that, money isn't designed to amplify the full range of our human experience. Money is issued in the world as debt, and to pay off that debt we need constant growth. Over time, that forces us to commoditize goods and services that otherwise would just be shared for the love of it -- give somebody a ride, cook a meal for a neighbor, have a friend crash on your couch. We now start to put price tags on everything. Moreover, money orientation breeds a sense of scarcity that isn't good for our minds, hearts or brains. So how can we build a bigger pie? In other words, what are these other forms of capital that we can tap into? We stumbled across this actually by accident. In 1999 we were a bunch of 20-somethings in the Silicon Valley and we started an organization called ServiceSpace. We just wanted to give. We started by building websites for nonprofits, purely as a labor of love. But over time people told us that, “Look, if you want to scale this up and you want to continue this over a long period of time, you're going to have to monetize.” Sixteen years later, our work is touching millions of lives and we still haven't monetized, we don't host any ads, and we're not fundraising. How did that work? It worked because we tapped into a gold mine, a gold mine of alternative forms of wealth. I want to highlight a couple of them today. 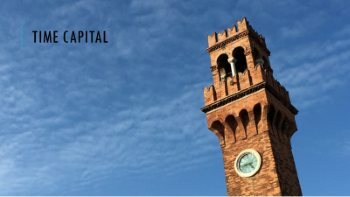 The first one is time capital. We all understand this intuitively. We have time. We think of this in terms of jobs usually and we say, “I have time, and this is where I offer my time at my work.” But turns out we're actually really bad at understanding and honoring this kind of time capital. A Gallup poll released last year said 71% people feel disengaged at work. It's costing us $350 billion. Not only that, we actually have a lot of time to give -- time that could be diverted into so many different directions. We watch 200 billion hours of TV every year, 200 billion. And this one got to me. We play 300 million minutes of video games every single day. Can we channel that in different directions? Can we channel it towards constructive social change? Technology is actually helping us do that. There are a lot of creative examples, like Wikipedia. We don't think of Wikipedia as a place where people go to volunteer, but actually researchers have found out that 100 million volunteer hours have been contributed on Wikipedia, and that's just 1% of what's possible. The other 99 percent is still untapped. If time is a capital and an hour is a currency, you can you imagine that we could have time banks that allow us to maintain that currency. In fact, there are 300 of them around the world. In Vermont they even have care banks for providing informal care to elders. In Seattle, there's a great example -- a senior center called the Mount. The unique thing about this place is that they put a nursery right in the senior center! It allows for intergenerational learning. Now if you think about it, that's a really brilliant idea because both seniors and toddlers have a lot of time capital. You put them together and it allows for a lot of different exchange of wealth. Seniors have stories; they have experience; they have wisdom. Kids have curiosity, energy, and enthusiasm. And bringing those resources together allows for so much new value to be created. 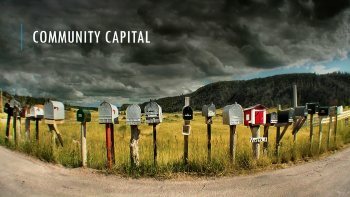 Another type of capital is community. We think of contributors as individuals usually, but actually 1 plus 1 ends up being greater than 2 because that plus sign in between has value. How we relate, how we connect to each other can end up changing the entire outcome. If you look at a piece of graphite and a piece of diamond, they're both made up of the same carbon atoms. The only difference is in how they're connected to each other. This idea of relationships ends up being a very important one. We don't have to go farther than our own dining tables to understand this. In one research study, the US was actually ranked 33 out of 35 countries, in terms of family time that we spend on the dining table. As they started studying this, it turned out that we actually get a lot of benefit simply by dining together. When kids are very young, their vocabulary grows. If you have slightly older kids, their test scores go up. Even older kids, they start to eat more fruits and veggies and they're less likely to be obese even in their later years. Binge drinking, depression, violence -- all these rates go down. You wouldn't think of that when you're thinking of the dining table because you're just having a meal together, but those relationships start to have all these ripple effects. Robert Waldinger, at Harvard, is the director of one of the longest studies on the good life. After 75 years of studies, they issued one major finding: good relationships are the key to better health and to more happiness. It comes down to relationships. And we don't have to go farther than Robert Putnam's seminal work, “Bowling Alone”, to see that this is actually in decline. We used to bowl together in leagues, but now we do it alone. It's not just bowling. We play cards alone. We don't engage in social community organizations. We’re less likely to vote. In fact, in one generation our trust has declined by more than half. 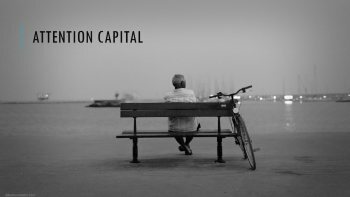 A subtler form of capital is attention capital. We all know this intuitively because the whole advertising industry is geared towards monetizing our attention. With this capital, goldfish were at the bottom of the rung -- with an attention span of nine seconds. Lo and behold, in 2015, we have replaced them at the bottom. Humans used to have a 12 second attention span but we're now at 8 seconds! Our minds are full. Instead of being mindful, we’re totally overloaded. Today's New York Times has more content than we would encounter in our entire lifespan in 17th century England. What all that content does is over-stimulates our nervous system. That over-stimulation totally leaves us feeling exhausted and dissatisfied. 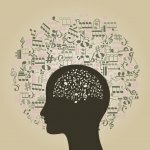 There are many different ways in which we can build our attention capital, and mindfulness meditation is certainly one of them. Megan Cowan is a friend who decided to build this capacity in schools. She set up a curriculum and she’d go classroom to classroom doing various practices. Here's one of her practices -- she would ring a bell and ask the students, “Can you just watch your breath until you can no longer hear the sound of the bell.” The kids would do this everyday. Years after she had started, I remember watching an ABC clip on their work. A young student was being interviewed and he said, “Things in my life weren't going so well. I sat on my bed one day and decided to end my life. But then I remembered that bell exercise, and thought maybe I’d just wait. Perhaps that feeling would go away -- and it did.” That kid is not only alive today, but doing really well. This is the power of attention capital, in the sense that a still mind gives us far greater choices to respond to the life in front of us. Time, community, and attention -- these are different kinds of capital. Each has its currency. Time is measured in hours, scales into time banks, and shows up as engagement in society. Community has the currency of relationships, leads to social networks and creates trust in our world. Attention leads to mindfulness and ultimately pro social acts. And we're not just limited to this. There are so many other forms of capital. Nature is a form of capital. Knowledge capital, with the currency of ideas leads to innovation in society. Technology is a form of capital, culture is a form of capital with the currency of stories, compassion is a form of capital with the currency of kind acts. 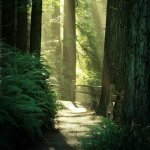 If we deeply start to consider this lens and broaden beyond the scope of money, we can really tilt the seesaw in a different direction -- perhaps towards greater love. My friend and an inspiration, Rev. Heng Sure is a Buddhist monk, who uses music as a tool for transformation. When he came out with a CD, he wondered if he should put a price tag on his CD or explore multiple forms of wealth. He chose the latter. Here is what he put on his website: "Recipe for downloading the CD -- perform a priceless act of kindness, write and submit a reflection of your experience, check your email to download the album." He got hundreds of submissions. One of them was a woman in Poland. She says, “My priceless act of kindness was calling my mom.” It happened to be Christmas eve, lights were out, and Mom was sitting in the dark, crying. “Why mom?” the daughter asks. She says, “Well, it's Christmas and I didn't want my neighbors to know that I'm home all alone.” Mom and Dad were divorced and the local family was with the Dad, and Mom was alone. So this woman packed up her bags and ended up spending Christmas with her mom. Now, imagine offering a song to somebody and receiving such an act of kindness in return. Truly priceless. 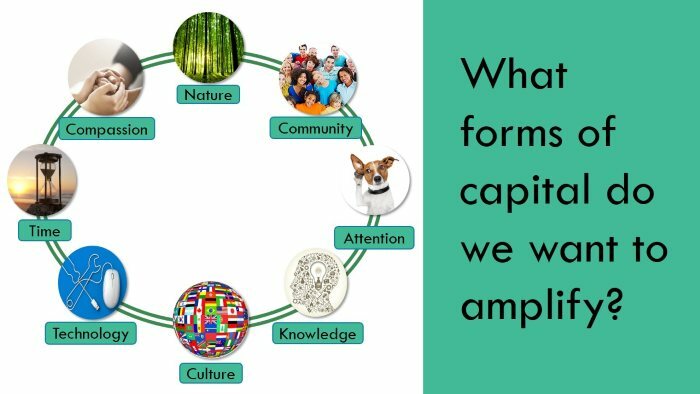 The question we're left with is this -- what forms of capital do we want to amplify? If we broaden that lens, the possibilities are limitless. If we use our hearts to assume value everywhere, if we use our heads to wisely invest in the greatest of our capitals, if we use our hands to courageously design for the full spectrum of this wealth, we will create an entirely new solution set for a thriving humanity. May our hands, head, and heart continue to stay aligned in the direction of all forms of capital. Nipun Mehta is the founder of ServiceSpace.org, a nonprofit that works at the intersection of gift-ecology, technology and volunteerism. 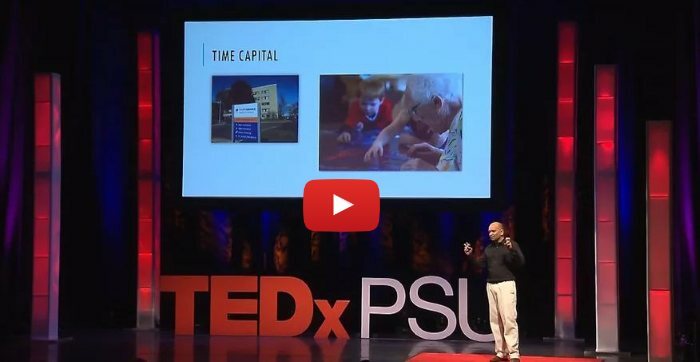 The above is a transcript of this TEDx talk at Penn State University.